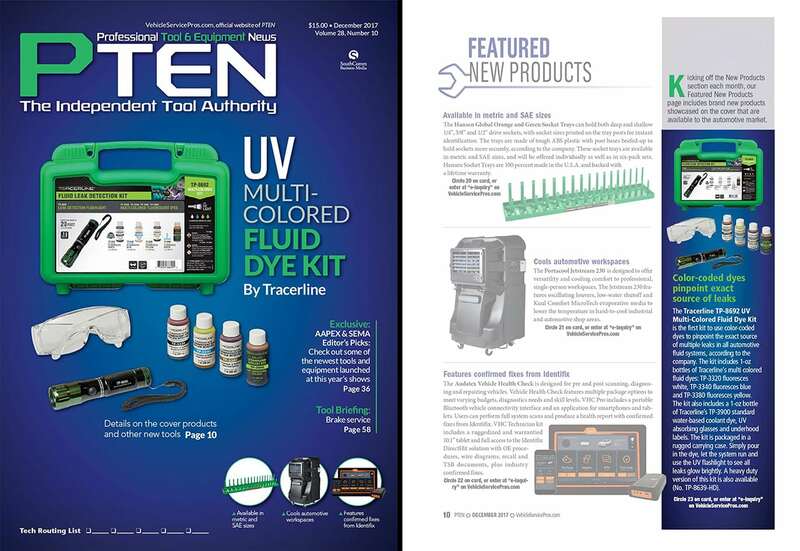 Tracerline’s UV Multi-Colored Fluid Dye Kit has been featured on the cover of Professional Tool and Equipment Magazine’s December 2017 Issue. It is the first and only completely customizable, color-coded leak detection kit for all fluid-based vehicle systems. With a set of color-coded leak detection dyes, a single technician can diagnosis leaks across multiple vehicle systems. The kit includes three color-coded dyes for petroleum and synthetic-based fluids: white dye, yellow dye, and blue dye (red dye is sold separately). These multi-color dyes allow a technician to check for transmission, brake, oil, fuel, power steering, and other fluid-based leaks. The kit also includes a specially designed green fluorescent dye for conventional coolant. Tracerline’s UV dyes are concentrated, safe to use, and they won’t affect the vehicle system’s chemical properties or change how the fluid works. These specialty dyes can remain safely within the fluid system. That means once the repair is made, the dye can be used as part of a preventative maintenance program. Every time a customer comes back to have their vehicle serviced, all a technician has to do is scan the vehicle’s system with a UV leak detection lamp. 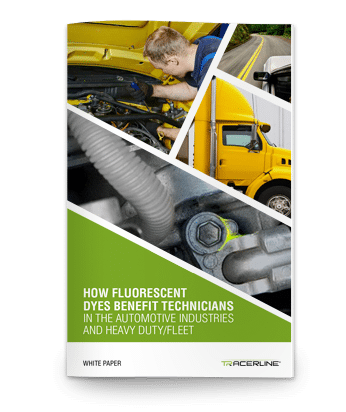 If there are new leaks in the system, the fluorescent dye will glow brilliantly and indicate the exact location of all new leaks, across all fluid-based vehicle systems. In a 2017 survey, more than ¾ of automotive technicians said color-coded UV leak detection dyes have made diagnosing leaks a less time-consuming hassle. 82% of respondents saved at least 30 minutes during the leak detection process (per vehicle system). More than two-thirds of shop owners reported customer satisfaction “greatly improved” since introducing Tracerline’s fluorescent leak detection dyes as part of their diagnostic and preventative maintenance plan. Based on Tracerline’s 2016 polling data, UV leak detection dyes reduced service callbacks by 67% percent. Tracerline TP-8692 Kit Automotive Leak Detection Kit from Tracer Products on Vimeo. How Do Automotive Leaks Occur? Vehicles on the road today are around 11 ½ years old. Over time, cars are naturally exposed to wear-and-tear. Mechanical components such as gaskets, hoses, and other critical parts degrade and become faulty. According to the Los Angeles Times, automakers are building better vehicles. Quality improvements to materials and design have increased the service life of nearly all vehicles on the road today. Car owners are also taking better care of their vehicles because they want to sell or have trade-in value when they’re ready for their next car purchase. There are about 258 million light vehicles on U.S. roads today. About 120 million of those vehicles are between 6-14 years old. Since 2006, car owners have held on to their vehicles 2 years longer before disposing of them, according to the research firm HIS Automotive. Overall, the U.S. is adding more cars on the road but not scrapping older vehicles. New vehicle registrations outpaced scrappage by more than 42% — the highest rate since HIS Automotive began compiling data. That means more cars on the road today are older and are more likely to have operational fluid leaks due to wear-and-tear. Coolant systems, for example, are prone to fluid leaks and provide one of the most important functions to the proper operation of your vehicle. Coolant dissipates heat and helps regulate engine temperature. Coolant leaks can occur through a hole in your radiator. Corrosion or damage caused by debris can create leaks. A blown head gasket, for example, will allow coolant to leak from your engine and onto the ground. There are many ways to detect leaks. But only one method allows a mechanic to visibly see all leaks glow brightly throughout an entire vehicle system: ultraviolet leak detection. How Does UV Fluorescent Leak Detection Work? UV light is a form of electromagnetic radiation, along with visible light, infrared, and x-rays. UV light radiates at shorter wavelengths than visible light and cannot be seen by the human eye. However, when UV light is absorbed by fluorescent materials, brilliant light is reflected back towards the eye as longer wavelength visible radiation, or visible light. This phenomenon is referred to as UV-induced visible fluorescence. Tracerline’s ultraviolet leak detection method utilizes fluorescent technology to detect the smallest leaks. Because leaks can happen anywhere, it is sometimes very difficult to find all leaks even within the same vehicle system. In our latest 2017 survey, over 54% of automotive professionals polled said they experienced repair callbacks from frustrated customers. The respondents said they lost income, time, and suffered reputational damage because they couldn’t find system leaks accurately and provide effective repairs. Ultraviolet leak detection, by far, is the easiest and safest way for an automotive mechanic to detect leaks in all fluid-based vehicle systems. Other methods of leak detection require suboptimal visual inspection, pressure differential testing, and measurements elapsing over a long period of time. These methods of leak detection are often imperfect and do not provide leak detection results in a timely manner (such as when a mechanic is working on a vehicle and the customer is expecting the vehicle to be fixed as soon as possible). One of the greatest benefits of the UV Multi-Colored Fluid Dye Kit is that it offers leak detection for all automotive systems – including coolant, brake, transmission, oil, fuel, and other vital vehicle systems. In a single service call, an automotive professional can scan all automotive fluid systems easily with an ultraviolet leak detection lamp. To use the Multi-Colored Dye Kit’s contents, add the appropriate dye to the systems being serviced. Run the system for ten minutes to let the dye circulate. Inspect the system with the TP-8695, a powerful ultraviolet LED leak detection flashlight included in the kit. The TP-8695 has a range of 20 feet and is compact. Leak areas with escaping dye will fluoresce brightly when exposed to ultraviolet light. Tracerline’s leak detection dyes offer a versatile range of benefits. In terms of quality, Tracerline works closely with international engineering associations to craft the safest and most compatible dyes available on the market today. Tracerline’s dyes meet the most stringent engineering standards and is most trusted name in the automotive leak detection. Founder, Bill Cooper, invented the original fluorescent leak detection technology over 60 years ago. 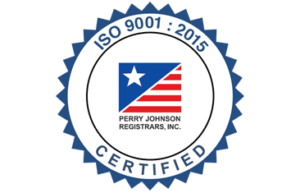 Today, Tracerline leads the field and is cited as the industry standard. More than half of automotive professionals polled in 2017 said they wouldn’t use any other method of leak detection over ultraviolet leak detection. Almost all respondents said they would use ultraviolet leak detection dyes as part of a preventative maintenance program. 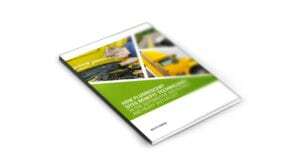 Learn more about fluorescent leak detection in our industry-defining whitepaper. In our next segment we’ll discuss how the UV Multi-Colored Fluid Dye Kit is used in the field. We’ll show you all latest preventative maintenance techniques and discuss industry trends. Do you know how to keep your vehicle running past the +200,000 mile mark? Can you prevent thousands of dollars in repairs by following simple methods preventative maintenance? Yes, everyone can extend the service life of their vehicle by two years or more. The best part of this equation: preventative maintenance is cheap and easy to perform. Follow our next segment to learn more. Tracer Products Overview from Tracer Products on Vimeo.